An extensive, multi-site field study was conducted in the Germany, France, and Spain to evaluate the efficacy of Exzolt (0.5 mg fluralaner/kg BW in drinking water twice at a 7-day interval) for treating natural infestations of poultry red mites (D. gallinae) at a variety of commercial poultry farms.1 The study was conducted at 9 sites involving 5 layer farms, 2 breeder farms, and 2 replacement chicken (pullet) farms (Table 5-2), using a protocol similar to the previous dose-confirmation studies. 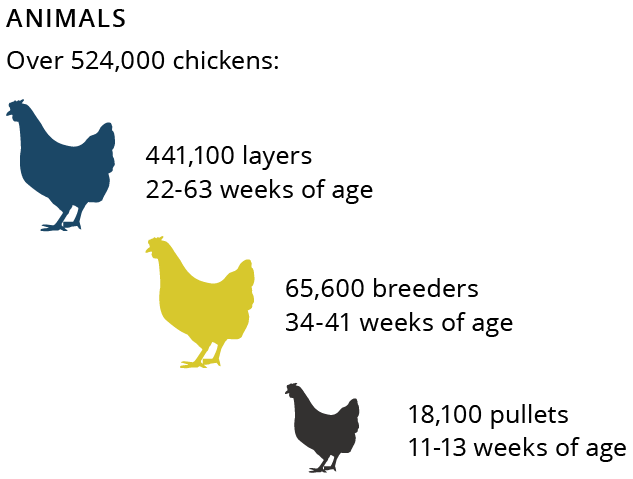 Relevant chicken production types (layers, breeders, pullets). Various housing systems (barn, barn with free-range, enriched cages). Various drinking water systems (dosing pump, medication tank, gravity tank). Field efficacy study at 9 sites, controlled and partially blinded. Each site was a qualifying commercial chicken farm (5 in Germany, 3 in France, 1 in Spain) with 2 comparable houses naturally infested with poultry red mites (no recent acaricide treatment). Sites were enrolled between mid May and late July, at the peak of mite season. The 2 houses at each of the 9 sites (550-100,000 birds/house) were as similar as possible with regard to size, breed and age of chickens, feed/ water distribution systems, housing system, climate control, and cleaning system (Table 5-2). Mite infestation levels of each house were assessed using mite traps. Field isolates of study mites were confirmed to be susceptible to fluralaner using a contact in vitro test (LC90 < 15.63 ppm for 7/9 isolates, and 15.63-31.25 ppm for the other 2 isolates). On day 0 at each farm, birds in 1 house were treated with Exzolt (0.5 mg/kg BW/day twice 7 days apart) and the remaining house was left untreated (controls). Houses with the highest mite infestations were usually selected for Exzolt treatment, for animal welfare reasons. Additional mite traps were placed at the same locations on day -1 (baseline infestation level) and at multiple time-points thereafter. Traps were removed after 24 hours for mite differentiation and counting. Data were also collected regarding the number of dead chickens and laid eggs, and 2 flocks were observed for adverse events. Rates of incubation, fertility, and hatchability were recorded for the 2 breeder farms. Personnel involved in the assessment of efficacy and safety criteria were blinded to treatment group assignments. The control house at 3 sites (L1, L3, L5) had to be treated for mites during the study due to an unacceptable mite burden (animal welfare). After treatment at site L3, mite counts for efficacy assessment were still available and > 95% through the end of the production cycle at day 238. Efficacy assessment was based on the percentage reduction of mites (larvae, nymphs, adults) in the treated house at each post-treatment time point compared to the control house. Production parameters were descriptively analyzed. 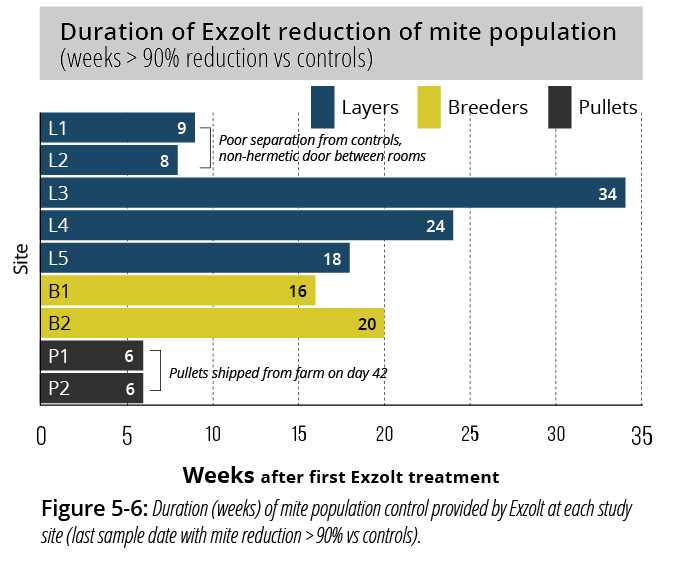 The efficacy of Exzolt (against all mite stages) compared to controls is summarized in Figure 5-5. The onset of efficacy was very fast, with an overall average mite reduction of 46.6% observed after the first night following the day of initial treatment (day 0; trap placed and mites collected for 24 hours). Efficacy was already 97.6% on day 3, achieved >97% by day 6, and persisted at that level for a lengthy period of time depending on the farm (100% efficacy at day 14 after the second Exzolt dose in 7/9 farms). A similar degree of fast and high onset of mite control efficacy was observed in all production types (layers, breeders, pullets) and housing systems. The duration of mite population control following the 2-dose Exzolt regimen was assessed at the house level using a threshold of 90% reduction vs non-medicated controls (Figure 5-6). The duration of mite control was long and variable (2-8 months) and did not depend on the production type or the drinking water system, but was impacted by the duration of the remaining time until the end of the chicken production cycle and on the level of house separation of the compared groups. At 6 sites (L3, L4, B1, B2, P1, P2), no decrease of efficacy was observed until the end of the study (6 to 34 weeks; the 6-week efficacy of the pullet sites reflected the short remaining production cycle and shipment/ removal of the birds). Three sites (L1, L2, L5) experienced a regrowth of the mite population in the treated group after 8 to 18 weeks. Regarding house separation, the presence of 2 rooms close to each other under 1 roof, separated by a wall but connected by an incompletely hermetic door, allowed faster mite regrowth in the treated house (in about 2 months) at sites L1 and L2 than that observed at farms with appropriately separated houses or rooms. Under real field conditions, the 2 houses would be treated at the same time. 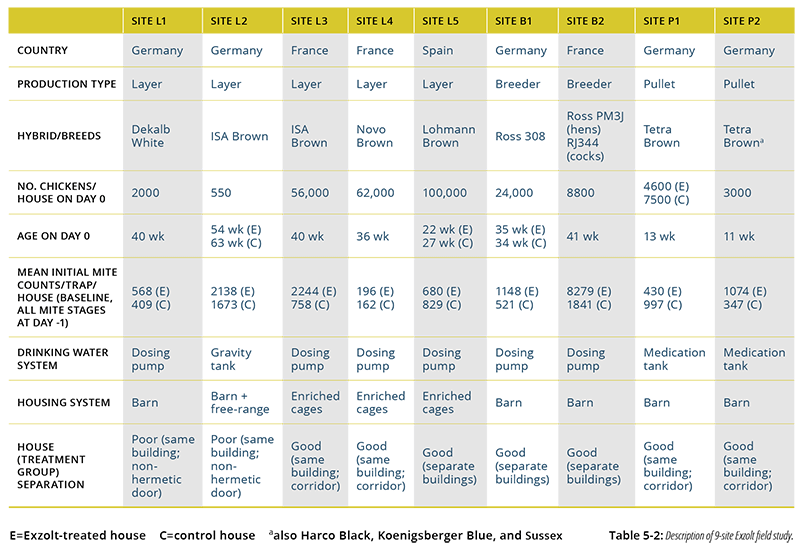 In 4 of the 5 layer and breeder farms with an appropriate separation between the study groups (sites L3, L4, B1, B2), the mite population was controlled until the end of the production cycle (16-34 weeks). Mortality was low at most of the farms and comparable between the study groups before and after treatment. 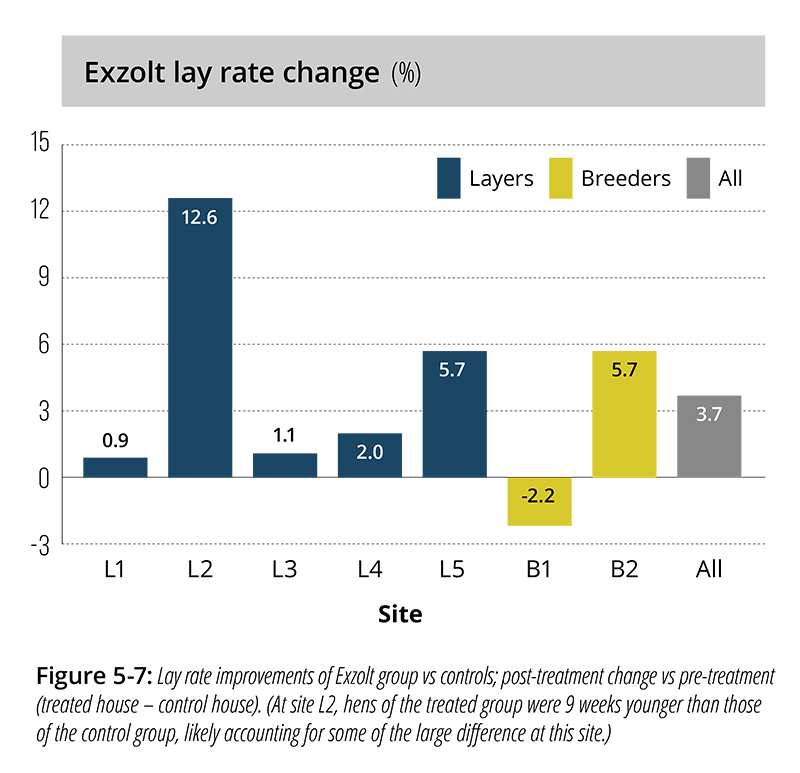 However, the acaricidal efficacy of Exzolt and resulting relief from mite infestation positively impacted the laying rate at 6 of the 7 layer or breeder farms, with a relative increase ranging from 0.9% to 12.6% (Figure 5-7). The sole site with reduced post-treatment lay rate (B1) had a known history of reduced performance in the house selected for treatment relative to the house used as a control. In regard to breeder performance, increased fertility and hatchability rates (2.8% and 1.7%, respectively) were observed at the B2 site, but no improvements were detected at the other B1 breeder farm (site houses not fully comparable for these parameters). No adverse events related to the use of Exzolt were reported during the study. The field study confirmed the high efficacy and excellent safety of Exzolt when administered in the drinking water (0.5 mg fluralaner/kg BW twice 7 days apart). 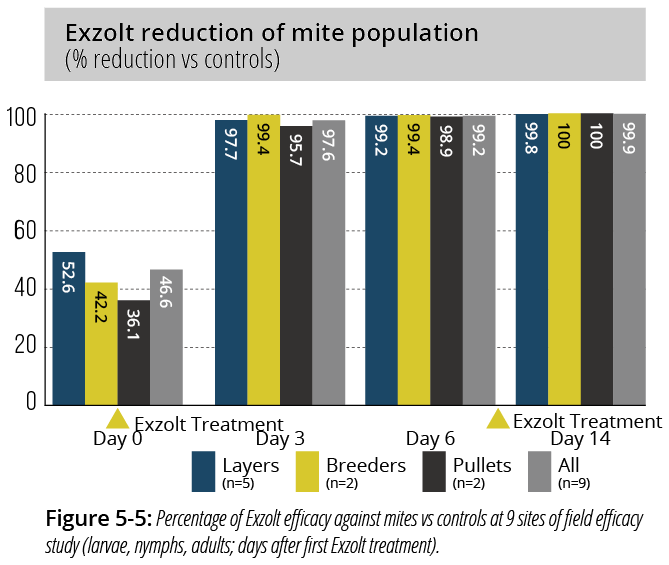 Under commercial production conditions at 9 diverse layer, breeder, or pullet farms, Exzolt provided fast and persistent reductions in mite counts and positively impacted production parameters (rates of lay, fertility, hatchability). The 2-dose Exzolt regimen successfully controlled natural mite infestations for extended periods, far exceeding the time of actual drug administration (e.g., up to 34 weeks, or nearly 8 months, at 1 layer farm). 1 Data on file. MSD Animal Health. The development and approval of Exzolt (fluralaner) solution for treatment via drinking water now offers an unparalleled approach for management of poultry red mites in chickens. 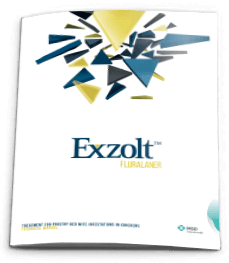 The Exzolt Technical Manual provides useful and comprehensive information about this cost-effective and revolutionary product.